More on Abu Usamah at-Thahabi……. – The Tundra Tabloids……. More on Abu Usamah at-Thahabi……. 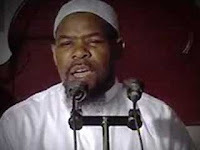 The American Muslim cleric who promotes hate and murder of non-Muslims, was featured in the British documentary “Dispatches” (all six segments viewable here), agreeing in prinicple for the crucifixion of a convert from Islam (within an Islamic state), and to be left hanging to bleed for three days. The spin Abu Usama puts on the highly offensive remarks he made in the secretly taken footage (viewable here), such as women being “deficient” in their intellect, are placed within the context of the decrees made by his prophet Mohamed, that it takes “two women in a court to bring witness against a man.” So here we have a modern day Muslim man defending the misogyny of his prophet Mohamed that a woman is not equal to a man. Hmmmm, I wonder if that will get the Liberals finally engaged? Previous Post Previous Post Carter Watch, Jimmy = Empty Chair……. Next Post Next Post Leftist Anti-Semitism In Sweden…….